In January of 1968, my family and I moved twenty five miles north of Deckerville, Michigan to Harbor Beach, Michigan. My dad had taken a teaching job in Harbor Beach the previous fall and the family made the move at the start of the second semester. Our first home was on Whitcomb Street in Harbor Beach. It was on a street with other very nice family homes. This is probably the home I remember the least. The above floor plan is the best I could remember. I know we moved in the summer of 1968 because my brother, Neil, was born in August and we were in a new place by then. Meeting new friends, Sharlene and Marsha. I was in the bedroom and heard a noise outside the window, I looked and they mouthed, "Can you come outside and play?" Sharlene lived across the street from us and we had many good times running back and forth to each others' houses. We recently reconnected on Facebook (one of the reasons I love facebook). Cooking scrambled eggs on an electric stove for the first time. I was use to gas. Of course, I burned them when I turned the burner off and left the eggs in the pan on the burner. Walking home for lunch because I wasn't comfortable in the lunch room at my new school. Wanting to play in the basement, but it was a wet basement. Throwing a ball in the living room and knocking over a vase and breaking it. My sister and I hoped mom wouldn't notice (we were young, what can I say). She did notice! Hearing about my Grandpa Fredricks death, my parents went to the funeral and we had an older women stay with us. My niece, Cutie Pie, turns 1 today. I have yet to meet her. That will be remedied in 45 days! I can hardly wait. I hope you are enjoying your first birthday, Cutie Pie. Here's a little photo tribute for your big day. Round of applause for me! Samuel Stillman Glover, Jr's Civil War Pension File was filled with information about Samuel. He applied for numerous increases to his pension and left a paper trail of where he lived in the process. Below are Samuel's place of residence from 1863, when he returned home from the civil war, to 1904, when he died. Week 21: Commercials. Do you remember any commercial jingles from your childhood? Share them here. 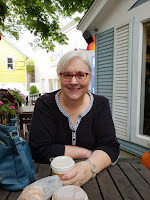 Can you fill in the rest of my blog title? "Oh, I'd love to be an Oscar Mayer wiener, that is what I'd truly like to be, for if I was an Oscar Mayer wiener, everyone would be in love with me." I don't know why this jingle resonates with me, but it was the first one I thought of when I saw the blog prompt. The commercial I remember is of a line of kids marching along singing the jingle. I decided to google it and see what I could find and I found the 1965 commercial on you tube. "Hot Dogs, Armour hot dogs, what kinds of kids eat armour hot dogs? Fat kids, skinny kids, kids who climb on rocks, tall kids, sissy kids, even kids with chicken pox love hot dogs, the dogs kids love to bite." "Ai Yi Yi Yi, I am the frito bandito" If I remember right it was in a commercial with a bouncing frito bag. I must have had a thing for hot dogs as a kid. Of course, all three are food related. Please don't blame me if these jingles stick in your head all day. What commercial jingles remind you of your childhood? This month's Battle Creek local history post will be about the Kellogg House. The Kellogg Foundation, located in Battle Creek, Michigan was in the process of building a new headquarters and decided to buy and move W. K. Kellogg's home to a location on the grounds of their new building. One Saturday morning in March of 1990, the overhead utility lines were taken down and the house was loaded onto a flat bed truck to be moved from 256 W. Van Buren Street, to its' present location, five blocks away. The Kellogg House can be found across the river from the Kellogg Foundation headquarters. Division Avenue, E. Van Buren Street and Capital Avenue borders it, with access from Monroe Street off of E. Van Buren Street, in Battle Creek, Michigan. Today the completely, renovated Kellogg House sits in a park-like setting with beautiful trees, flowers and lawn. The memorial to the Underground Railroad can be found near the Kellogg House. The house isn't open to the public, but you can walk around the well-kept grounds. It is a popular place for pictures to be taken at. My son, Travis, and his friends had their Senior Prom pictures taken on the grounds of it. Pictures of the move can be found on the Willard Library's Photographs from Battle Creek History Houses site. Scroll down and click on W. K. Kellogg House links. 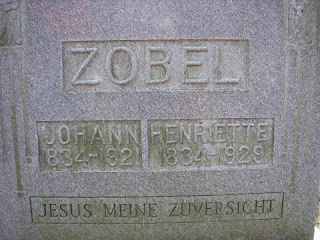 Johann 'John' Zobel and Henriette Fredrich are my great uncle and great aunt. Henriette Fredrich is the sister to J. August Fredrick, my maternal great grandfather. 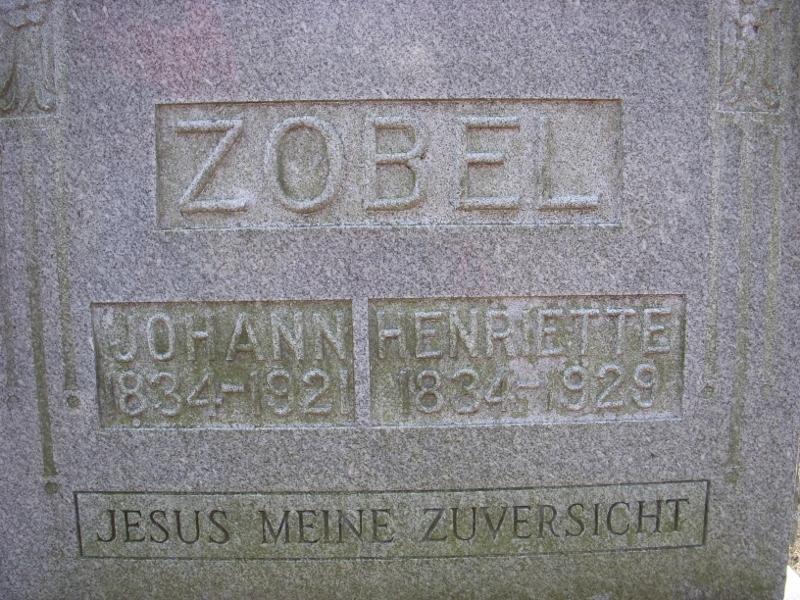 Johann Zobel and Henriette Fredrich were married in 1862, in Naklo (Nakel), Poznan, Prussia, now Poland. They were the parents to three sons, Henry, Julius and Charles; and two daughters, Albertina and Ottilie. My daughter is not the only one with acting credits to her name. Although, my daughter's resume is far more extensive than mine. 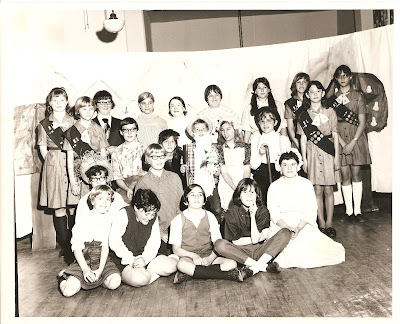 I was in one play, Rip Van Winkle, in the late 1960's. My girl scout troop put the play on for family and friends. We performed upstairs at the Community House in Harbor Beach, Michigan. I don't remember what part I had or any of the lines I had to say. My costume was a dress of my mothers. It was orange floral. I must say, I was stylin' in those glasses though. And I even put an arrow on my head, in case I forgot in the future what I looked like! Week 20: Fame. Tell us about any local brushes with fame. Were you ever in the newspaper? Why? You may also describe any press mentions of your family members. J. August Fredrick is my maternal great grandfather who immigrated to the United States around 1871. No one knows a lot about his family and he has been a source of frustration for me. Since I wasn't getting anywhere with him, I decided to research his sisters. I knew he had three sisters who came to the United States because they were listed in his obituary. I was hoping to find information that would lead me to what part of Prussia J. August was from. I found a little more than I thought I would! ﻿Source: The Pioneer Press, (Bear Lake, Michigan), 1 February 1924, front page, column 3, copy of newspaper from Manistee County Historical Museum, Manistee, Michigan. 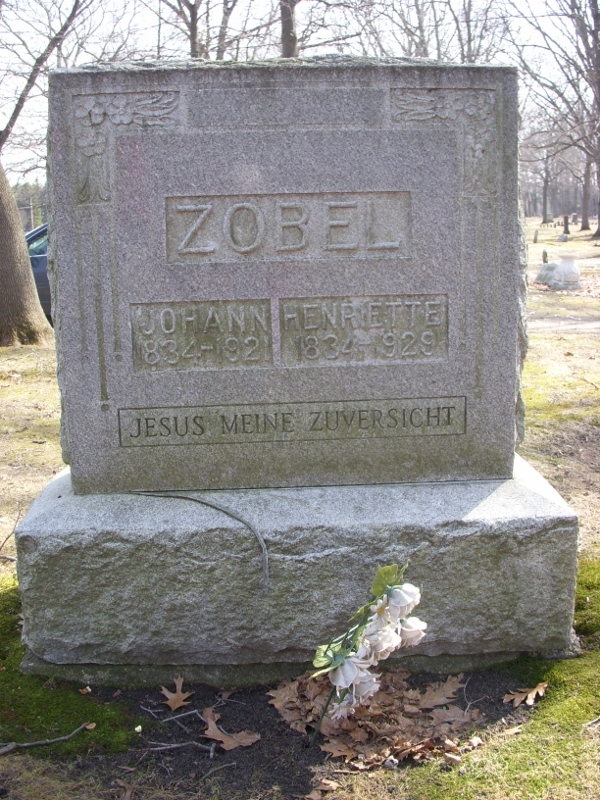 He had three sisters, Mrs. John Zobel, Mrs. August Guske and Mrs. Leo Engelhuber, listed in his obituary. I hit a genealogical jackpot when I searched the 1880 Manistee, Michigan census for the Guske family. I found the August Guhse family (August, Ottilie, Otto, Emma and Mary) listed. In addition, there was a mother-in-law, Susan King, listed. A mother-in-law, I did a double take! Had I found my great great grandmother? 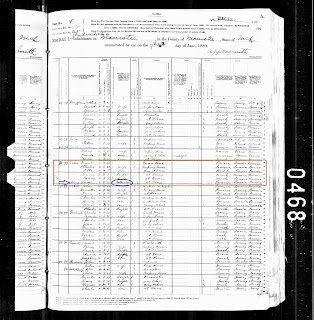 I was cautious as I had seen mother-in-law listed before on a Glover census record and it wasn't true, but I was excited anyway. Source: 1900 U.S. Census, , population schedule, Ward 1; Manistee, Manistee, Michigan, enumeration district (ED) 31, p 2A, dwelling 13, Head of household Aug Guhse; digital images, ancestry.com (: accessed 6 February 2011). 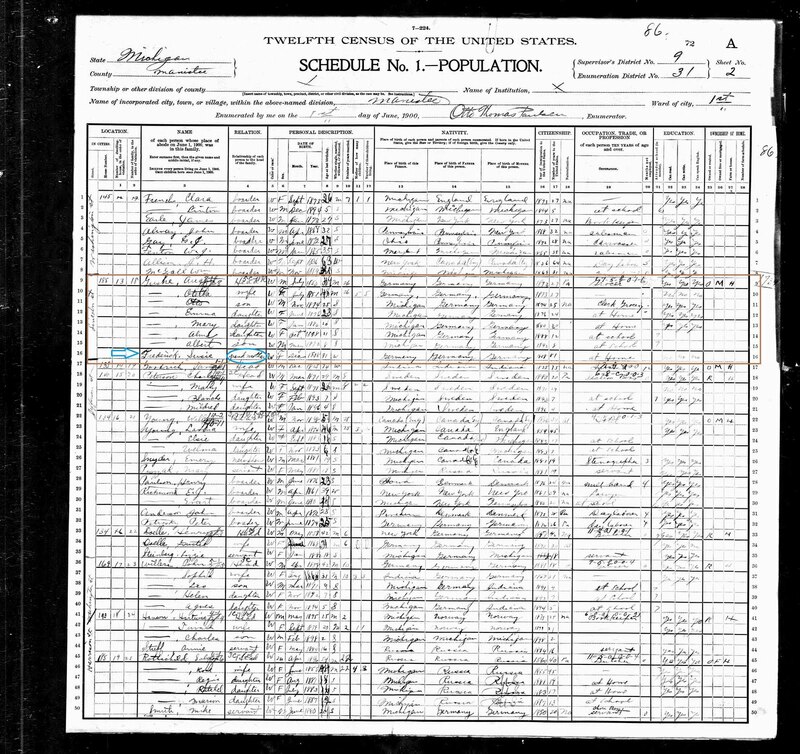 I continued my census searching and found the Guhse family in the 1900 Census for Manistee, Michigan. This time the August Guhse family included August, Otella, Otto, Emma, Mary, Alma, Albert AND Susie Frederick. 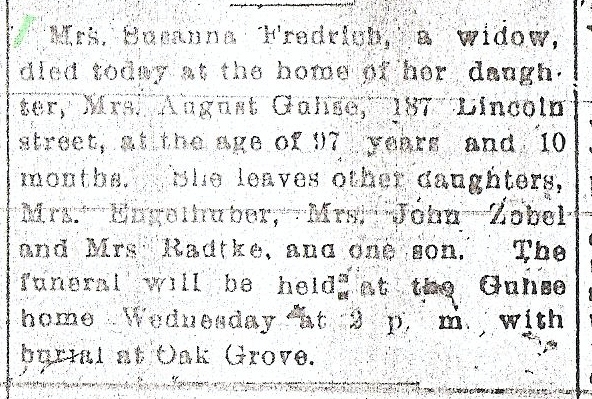 Susie Frederick was listed as grandmother this time. I was excited! No one in the family is going to believe that J. August Fredrick's mother was living in Manistee, Michigan. They don't think she came to the United States, let alone immigrated here. I figured if I was going to convince them I better do a little more digging. Source: Susanna Fredrich; Scandinavian passenger manifest, 21 October 1872, 107; in Canadian Passenger Lists, 1865-1935; C-4511 to C-4542 (Ottawa, Ontario, Canada: Library and Archives Canada), Roll C-4527. The next document I found was a passenger list for Susanna Fredrich, Amelia Fredrich, and Otelia Fredrich. They traveled from the port of Liverpool, England; Londenderry, Ireland to Quebec arriving 21 October 1872. Manistee, Michigan was listed as their destination to which ticketed. 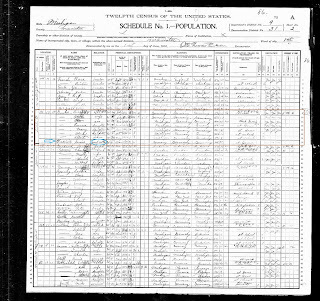 Michigan Deaths and Burials, 1800-1995 at familysearch.org has a record of Susana Fredrick's death. She died 4 Nov 1906 in Manistee, Michigan. Her father's name is listed as King. So, I believe when the 1880 Census was taken she was listed as Susan King for some reason. She did not read, write or speak English and this may have contributed to the information listed. Source: Manistee Daily News, (Manistee, Michigan), 4 November 1906, microfilm owned by Manistee Public Library, Manistee, Michigan; and Manistee County Historical Museum, Manistee, Michigan. 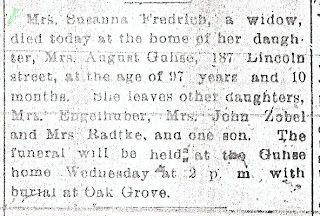 The last piece of information I have discovered, so far, is a short obituary from the Manistee Daily News stating she died at the home of her daughter, Mrs. August Guhse. The paper lists her survivors as daughters, Mrs. Engelhuber, Mrs. John Zobel, Mrs. Radtke, and one son. The one son is J. August Fredrick, I wonder why he wasn't listed by name. He lived about 20 miles from Manistee in Brethren, Michigan. Mrs. Radtke was actually her oldest granddaughter, Albertina Zobel. I think this shows the importance of researching brothers and sisters of your ancestors. 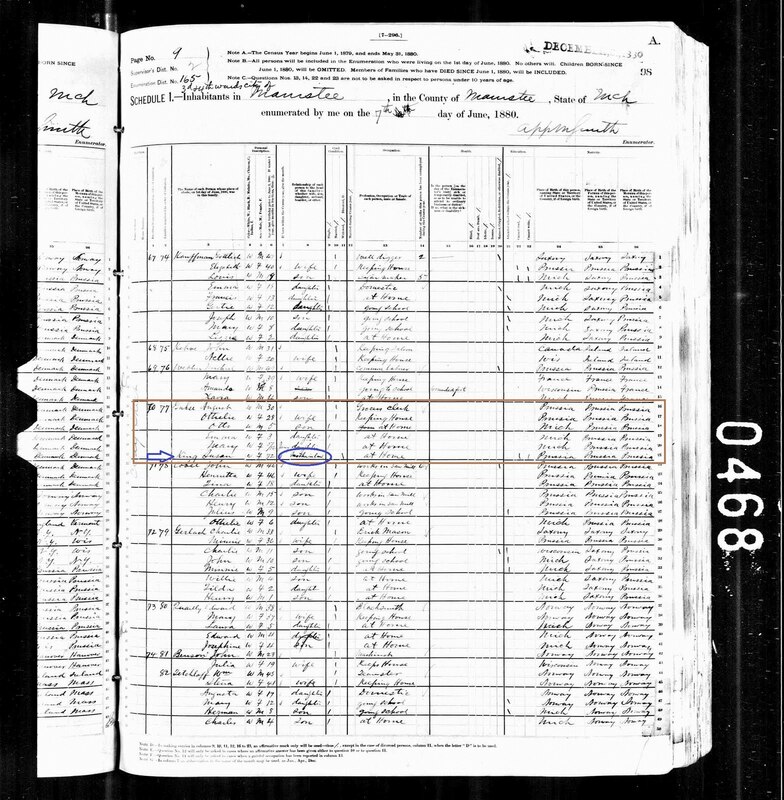 I never thought I would find my great, great grandmother in a United States census, but I did. I was just looking for more information in the 'hopes' it would lead me to new records. I ended up with a new ancestor instead. I now have more records to search (naturalization records). Plus, I have news to share with the family. Happy Mother's Day to all mothers. I hope your day is filled with making family memories. Do you remember Mother-Daughter banquets? Do they still have them? I remember them as early as about eight years of age. My mom, sister and I would go to our church, St. John Lutheran Church in Palms, Michigan, and celebrate Mother's Day, usually the Saturday before Mother's Day. The church basement was set up for this banquet. There was usually a program with readings or songs in honor of mothers and daughters. The tables were usually decorated with flowers and it was a very festive time. In 1968, we moved to Harbor Beach, Michigan and they had banquets too. We attended ﻿Zion Lutheran Church on Garden Street in Harbor Beach. There was a Lutheran school across the street from the church. The school gymnasium was the place to honor mothers. We attended a few banquets here. By this time, we had added another sister to the family. I remember, in high school, helping to plan one of the banquets. Usually a mother would read a tribute to daughters and a daughter would read a tribute to mothers. A beautiful Mother's Day cake was dessert. I only remember attending two as a mother. Our current church doesn't get into that. One year my mother; myself and daughter, Kirsten; my sister, Nancy and daughter, Brianna went to the Battle Creek Inn in Battle Creek, Michigan for the Mother-Daughter Banquet that our church organized. I remember thinking how special it was to share it with my mother and sister. One year was a magic theme with entertainment by a magician. The next year was a flower theme with a Master Gardener as the speaker. Below is the ticket and program from the "Magic Moments" Mother-Daughter Brunch in 1992. My daughter was 8 that year. Week 19 Bedroom: Describe your childhood bedroom. What furniture did it contain? Were there curtains, wallpaper or paint? Was it messy or clean? Did you share a room with your siblings? I had six different bedrooms from birth to age 18. I have written about three of them in Those Places Thursday posts. I had my own room at various times for the first nine years of my life. My younger sister, Nancy, was born and that changed the bedroom configurations a little. The first house we moved to in Harbor Beach, Michigan was a four bedroom one and I had my own bedroom then. I slept in a twin bed in a room next to the bathroom. The walls were painted and the floors wood. I remember high windows that looked over the back yard. There were beige curtains on the windows. I had a bookcase, a dresser and the dining room table in my room. Yes, you read that right. We didn't have a formal dining room in this house. The dining room table was blond wood and the sides folded down, so it didn't take up as much space as those today do. I remember doing my homework on it. It was clean! I am a little bit of a neatnik. (Okay full disclosure here, a lot of a neatnik.) I like to have my space clean and organized. My mom would dust and vacuum, but I kept things pretty neat. I wasn't one to throw clothes on the floor and we weren't allowed food or drinks in our bedrooms. I always made my bed and still do. Even when I shared a room with a sister or two, it was neat. Luckily, my sister is a neatnik, too. We inherited it from our mother! Hattie's Bible has been such a treasure to me. One of the papers stored within the pages of the Bible was E.A. 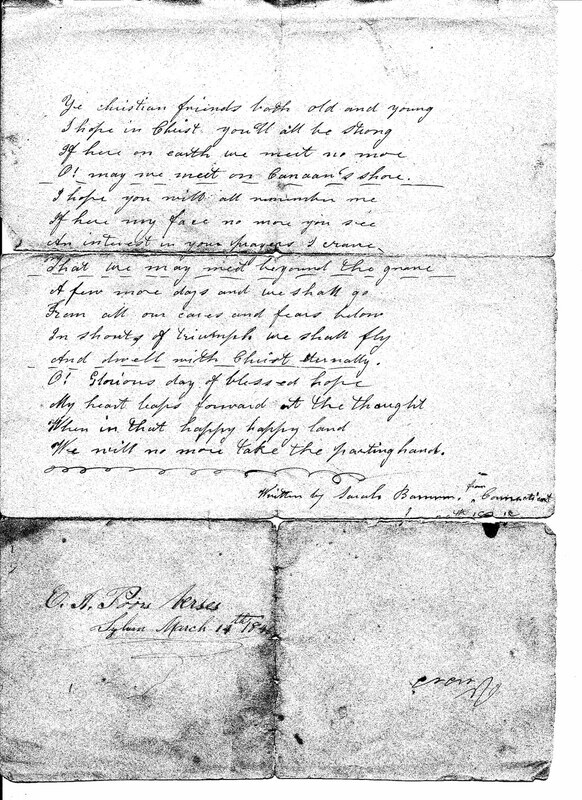 Poor's Verses, dated March 14th 1846. I believe this is Hattie Fenn Glover's mother, Elizabeth Ann Poor Fenn, my great great grandmother. She would have been 20 years old in 1846. 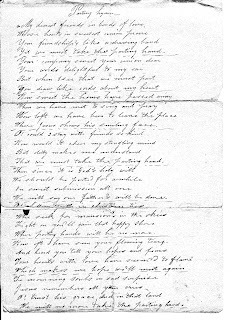 At the end of the verses it says it was "Written by Sarah Barnum from Connecticut" and a date that is difficult to read because it is in the crease of the paper. I do not know who Sarah Barnum was. 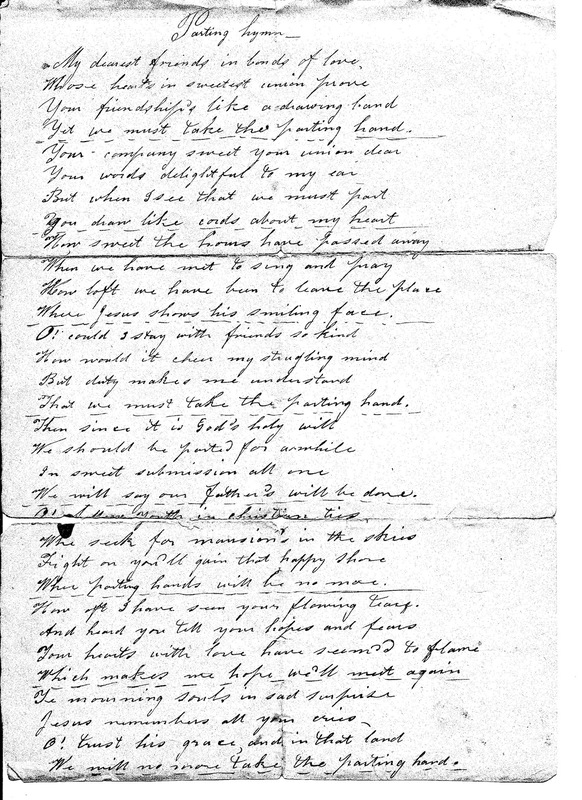 After researching the verses, I learned that this is a hymn titled, "Parting Hand". 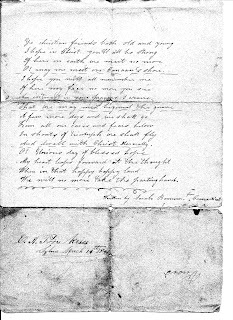 It was published in 1835 and can be found in "The Southern Harmony" hymnal, hymn number 113, listen here. I found it in a Baptist hymnal too. I was thrilled to be able to hear a version of it. I wonder if my gg grandmother hummed this as she did her work. Hattie Fenn's grandfather and grandmother, Daniel Fenn and Huldah Rowley Fenn, were founding members of the First Baptist Church of Sylvan, in Sylvan Township, Washtenaw, Michigan. The church was founded in July of 1833. You draw like cords about my heart. We will say our Father's will be done. When parting hands will be no more. How oft I have seen your flowing tears. We will no more take the parting hand. O! may we meet on Canaan's shore. That we may meet beyond tho grave. and dwell with Christ eternally. Week 18: Weather. Do you have any memorable weather memories from your childhood? How did your family cope and pass the time with adverse weather? When faced with bad weather in the present day, what do you do when you're stuck at home? Doesn't seem to be a shadow in the city"
This song comes to me on hot, summer days. Too bad today isn't one of them. I lived in a town more than a city growing up, but it still got hot. Hot summer days could be blistering. What is one to do? Head to the beach! The city beach in Harbor Beach, Michigan helped cool me off more times than I can count. My friends and I would hop on our bikes, grab our towels and take off down the hill to the beach. We would swim, sun bathe, jump off the dock and just have fun. Some of us would take a book, but I don't think anyone would read. Even in high school you could find me at the beach in the summer. I worked at a resort that was just south of the public beach in the summer. Now, I don't go to the beach much. It is a little over an hour to get to Lake Michigan and seems like too much work to go. We enjoy it on vacation. Hot days now are spent in the air conditioning or under our apple tree and guess what? I still love to read. 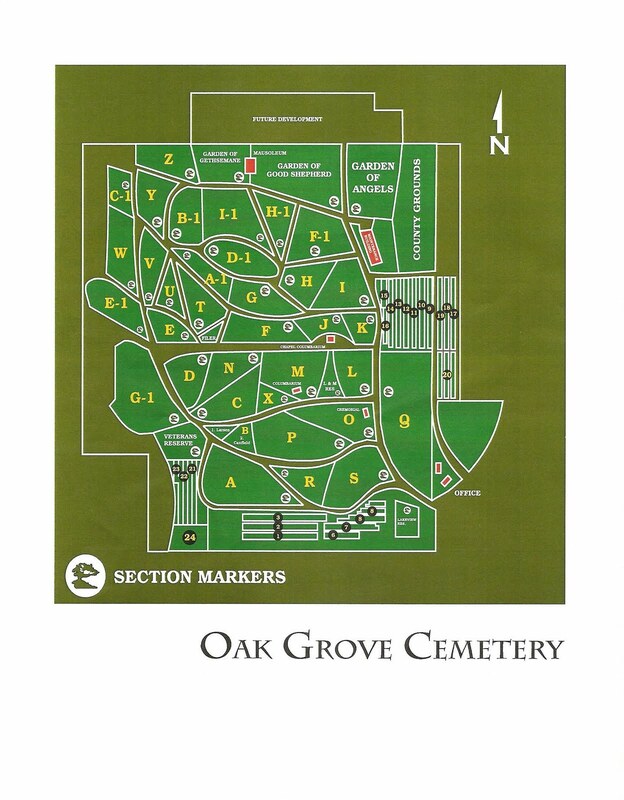 ﻿The above map shows the sections of Oak Grove Cemetery in Manistee, Michigan. 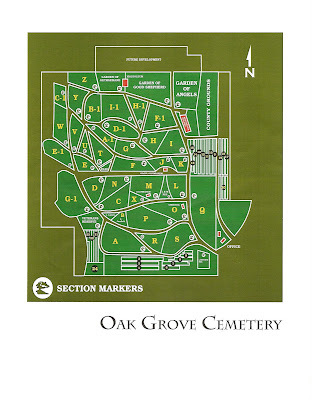 I used this wonderful map on a recent trip to Oak Grove and didn't have any trouble finding the sections. The entrance to this cemetery is on the lower right side of the map. The map shows that there are section markers, but I don't think they are all in place at this time. The Manistee Historical Museum surname card file includes burials in Oak Grove cemetery. The section (Lot) number is recorded on the surname card. These cards are sorted by surnames and are a wonderful resource for researching Manistee county families.